90% of our respondents will be celebrating Christmas this year. The second most popular response was Winter Solstice (also called Yule) chosen by 7.1%. 5% chose Hannukah, 2% chose Kwanzaa, and 3% will be celebrating Festivus, the holiday for the “rest of us” made famous by the popular TV show, “Seinfeld”. Most all of these celebrations will include some type of gift-giving as only 12% of respondents said they won’t be doing any holiday shopping this year. Women and consumers with annual incomes of $50,000-$200,000 were most likely to have their shopping already underway. Consumers ages 18-34 were most likely to start their shopping on Black Friday. 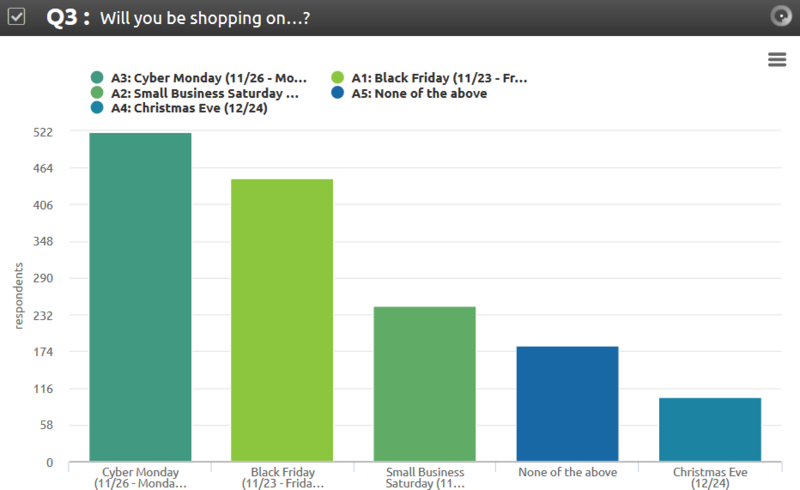 Of the 88% of respondents who plan to shop for the holidays, 59% will be shopping online on Cyber Monday, 51% will brave the stores on Black Friday, 28% plan to support small businesses by shopping on Small Business Saturday, and 12% will be shopping on Christmas Eve. Though some think they are impersonal, gift cards/gift certificates remain a popular gift item during the holiday season. Billions of dollars are spent on them each year. When asked how much they plan to spend on gift cards/gift certificates, our respondents averaged between $100 and $200, however, a small percentage said they would be spending $1000+ on gift cards alone. Significant others (58%), their children (58%), and parents/grandparents (57%) are at the top of the list when it comes to who is getting gifts this year. Others who can look forward to receiving gifts include friends (41%), pets (29%), co-workers (15%), and neighbors (12%). Women were more likely than men to be buying gifts for their children and their pets. The generosity of the holiday season extends to postal workers, garbage collectors, etc. with 11% of respondents saying they would be getting them gifts. And 5% of respondents said they would be getting gifts for strangers through participation in programs that answer letters to Santa. Among those who look for inspiration on social media, friends and family are the most trusted sources, each chosen by 21% of respondents. 16% said they trusted recommendations from brands on social media, 15% chose retailers, with the news media and celebrities bringing up the rear with 12% and 10%, respectively. Everywhere you turn, from social media to TV, DIY is ubiquitous. We were curious if the DIY trend was going to carry over into the holiday season. 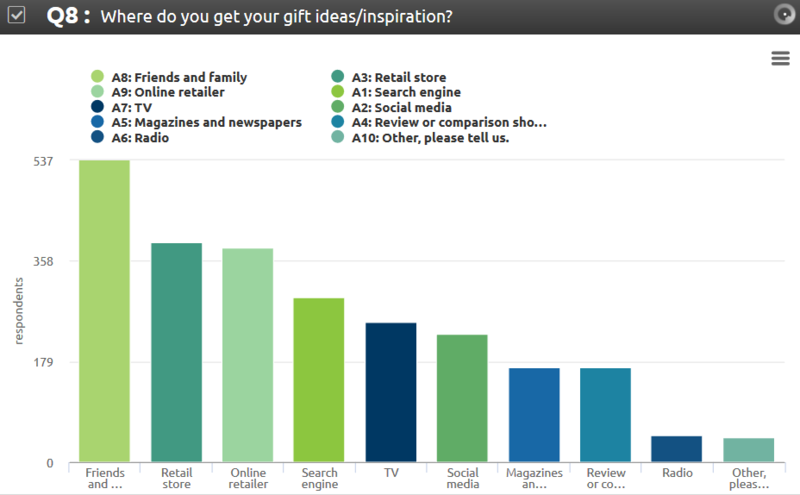 Looks like our respondents aren’t into making gifts themselves — 82% said they would mostly be purchasing gifts this year. Among the minority who said they would be creating their own gifts (knitted scarves, artwork, photography, baked goods, etc.) they plan to make 45% of their gifts and will purchase the rest. The Mall or the World Wide Web? Where will consumers shop for all of these gifts? The answer is — everywhere. 75% of our respondents said they will be shopping online but brick and mortar stores were not far behind with 56% saying they would be going to big box stores, 41% department stores, 32% specialty retailers, 26% locally owned businesses, and 22% heading to warehouse stores. Consumers are planning a 60/40 split between shopping online vs. in-store. Though a majority of their shopping will be online, our respondents overwhelmingly stated they do not plan to use any emerging technologies to assist with the shopping process. 83% chose “none of the above” when asked about usage of seamless checkout, social commerce, voice-assisted shopping, chatbots, virtual/augmented reality, etc. Truth is, they might actually be using them but aren’t aware of it as many of these technologies are an essential part of today’s e-commerce platforms. In today’s world, to shop online vs. in-store is not a true either/or proposition. Most consumers do a combination of the two methods to improve shopping efficiency and get the best deals. 52% of respondents said they will be researching online, then buying in the store, 37% will be buying online and picking up in the store, and 36% will research in the store, then buy online. Looks like 2018 is set to be a good year for retailers with most consumers spending over $500 on gifts and other holiday items. Though some like to complain that holiday decorations show up in the stores earlier and earlier each year, it turns out many consumers like to start their shopping early. 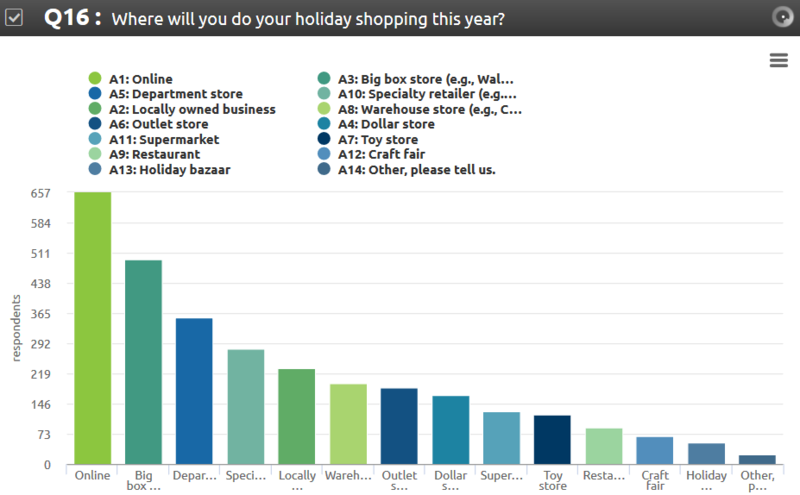 The internet is still the favorite place to buy holiday gifts but stores are not far behind. You can’t beat the internet for convenience and having your items show up on your doorstep. And you can’t beat stores for providing a festive place to feel the holiday cheer and interact directly with products. Both online and in-store shopping have their advantages and their devotees. Happy holidays to all and we hope you get all the gifts you desire! !